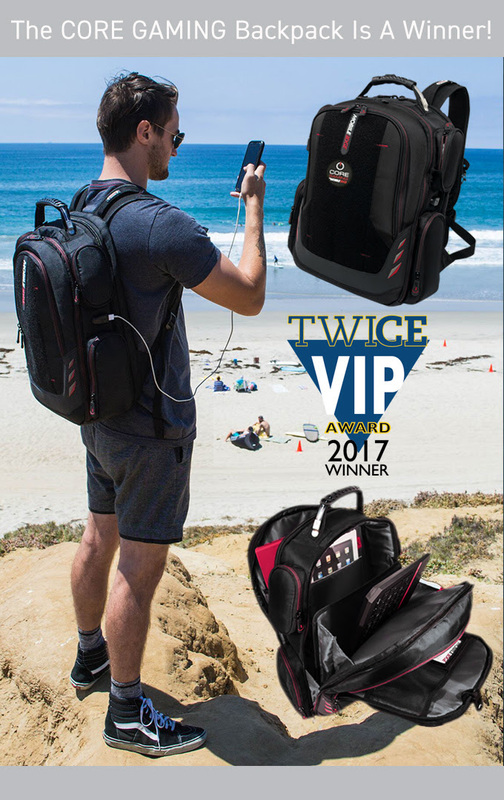 Mobile Edge’s new CORE Gaming Backpack has been named 2017 VIP Award Winner in TWICE Magazine’s PC Accessories category. Designed, prototyped, and tested by gamers for gamers, the new, full-featured CORE Gaming Backpack is the first product offered in Mobile Edge’s planned new lineup of gaming products. The CORE backpack is designed to provide gamers and people on-the-go the ultimate in transport, protection, storage, and easy access to gaming gear, accessories, and all the cool tech they can carry. This is the third year in a row that Mobile Edge has been awarded a TWICE VIP Product Award as voted/selected by industry retailers and resellers. For the Core Gaming Backpack to win this year, just as a Kickstarter Campaign gets underway to support its production, is a clear validation of it’s functional, stylish, and innovative design—as well as its expected popularity with gamers and other tech consumers. Mobile Edge announced on August 8 a 45-day Kickstarter campaign to support production of the CORE Backpack. Their goal is to raise $30,000 and have the bag available later this fall in time for holiday gift giving. The Kickstarter campaign offers supporters exclusive perks, including deep discounts on pricing and an additional 10 funding/backing levels. The CORE Backpack offers three large storage sections pre-wired for a power bank or external battery and four side accessory pockets for cables, phone, a gaming mouse, or oversized water bottles. The pack also features a built-in external USB charge port to provide instant power for phones or other devices. Constructed from rugged ballistic nylon, the CORE Backpack includes padded air-mesh shoulder straps, a molded top carry handle for easy lifting, and a trolley strap for stacking on other luggage. It also features a checkpoint-friendly laptop compartment, a separate fleece lined pouch for an iPad or tablet, a full-size keyboard pocket, a headphone holder, and a variety of other sections to hold files, extra gear, or personal items—pus, it’s covered by Mobile Edge’s famous lifetime warranty.